Southeast Bee Removal has been proudly serving the Columbus area since 2013. We have completed hundreds of honey bee removals and are very experienced at what we do. A typical job in Columbus, GA consists of locating the bees, safe removal of the entire hive (including bees, comb, and honey), repair of access area, sealing the bees out, and a guarantee against honey bee re- infestation. Here is one such hive that I removed from an old historic building in Georgia. 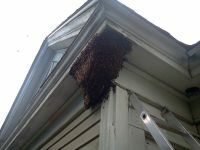 The building was over 100 years old and had two hives each forty feet off the ground on separate corners of the house. The owner had been bug bombing the rooms with the hives and killing thousands of them but the colonies were not dying because the pesticide was not reaching into where the main part of the bees were at. 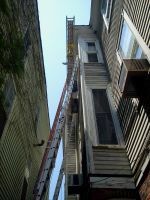 Roofers were roofing the adjoining building but could not continue with the bees so close. Southeast Bee Removal was contacted and I knew right from the start that this was no ordinary bee hive. It had likely been there for several years. The hive was exposed, and could be seen from the ground 40 feet below. The very fact that the nest was built on the outside of the eave was unique, possibly a sign it had run out of comfortable space on the inside. I removed the entire nest and the bees from the outside. This section could have been the size of one nest. I still saw bees flying under the siding so I drilled a small hole. Then discovered that honey comb was in the wall. I had to come out a second time to remove the rest of the hive that was in the wall because the lift I was using could not reach far enough back. The height and size of this entire hive was almost unreal. 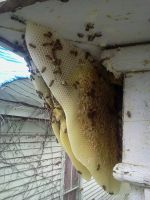 Like I said before, normally bees do not build on the outside of a structure in this part of the country. However, it had gotten so big that it was like its own bee removal on the outside. THEN, on the inside of the structure was the rest of the same hive! The hive on the outside was about 2 feet cubed and then the inside was about 2 feet by 4 feet, and altogether, at least 70,000 bees! I had to be very careful with the removal since I was 40 feet up, but finally after two days, I was able to successfully remove this gigantic honey bee colony and do the repairs. 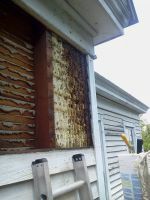 The second colony of bees was away from the roofers and did not need to be removed at the time. I have a feeling it was also an extremely large nest. These large hives do take more time to remove, but I enjoy the challenge they bring. Every since I discovered the world of bees I have enjoyed working with them and helping customers solve their bee problems! Southeast Bee Removal provides professional bee removal and relocation throughout the southeast including: Columbus, Weracoba Heights, Phenix City, Auburn, Opelika, Midland, Valley, LaGrange, Smiths Station, and the surrounding areas. To talk to a bee removal specialist and for a free bee removal quote give us a call today. We look forward to serving you!